The outlook for Britain’s manufacturers is deteriorating on the back of a cocktail of factors related to Brexit uncertainty, weaker global growth and the impact of protectionist policies according to a major survey published today by EEF the manufacturers’ organisation and business advisory firm BDO LLP. 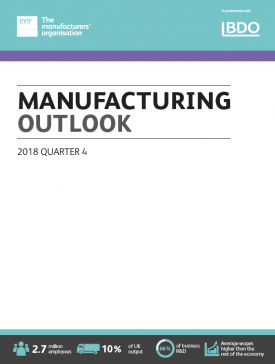 According to the Q4 EEF/BDO Manufacturing Outlook survey, while output and orders remain positive there has been a clear moderation in the strength of balances throughout the course of 2018, a trend which has accelerated in the final quarter. In particular, there has been a clear divergence in the last quarter between domestic and export orders, with the domestic picture backing anecdotal evidence that companies are putting in plans to increase inventory levels ahead of the UK’s exit from the EU. In contrast, exports which have boosted the manufacturing sector over the last few years appear to have hit the brakes. 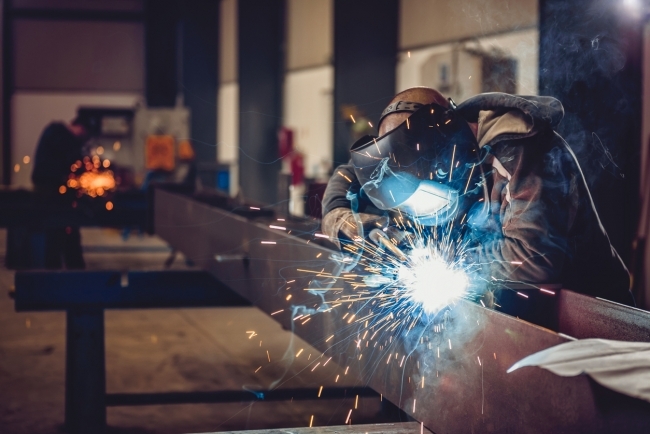 Stephen Phipson, Chief Executive of EEF, said: “The moderation in manufacturing performance over the course of this year appears to have gathered pace during the final quarter with more clouds on the horizon than there have been for some time. 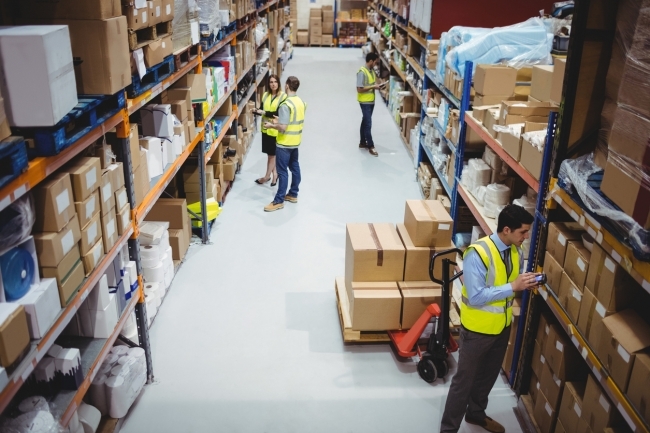 Tom Lawton, Head of Manufacturing at BDO added: “Manufacturers have remained reasonably confident over the course of the year but the sharp decline in export orders is a real cause for concern. “There are likely to be a number of causes for the fall in exports this quarter; uncertainty over our future relationship with the EU being the main one. In addition, more subdued global growth, the fading effects of sterling devaluation and the rise of protectionist policies appear to be starting to take their toll on growth. According to the survey, the output order balance was +22% which is a healthy figure by historical standards and represents the ninth consecutive quarter of positive output balances. The forecast for the next three months has drifted down to +19% but according to EEF, evidence suggests current output maybe more a reflection of precautionary stockpiling rather than production driven by demand. The picture for orders is far more mixed however. Whilst domestic orders have held up (+11% from +14% in Q3) the balance for export orders has halved from +24% in Q3 to +12%. Given the importance of exports in sustaining manufacturing growth over the last few years, it appears that more subdued global growth, the fading effects of sterling devaluation and more protectionist policies are now taking their toll on growth. The survey also shows some divergence in the performance of manufacturing sub-sectors with those related to construction performing well on the back of a bounce-back from the poor weather in the first half of the year and investment in infrastructure. Those sectors related to investment are performing less well, however, on the back of domestic uncertainty at home and weaker growth in global capital expenditure off the highs of recent years. As a result of the much weaker picture employment and investment intentions have weakened markedly. Whilst both are still in positive territory (for the eighth consecutive quarter) recruitment intentions have slipped to +12% from +21%, whilst investment intentions have seen a sharp decrease from +20% to +7%. This is in line with official data for business investment which is set to show a fall in 2018 and reflects the political and economic uncertainty. Whilst EEF has revised upward its growth forecast for manufacturing for 2018 from 0.9% to 1.1% as a result of the weaker outlook and uncertainty it has downgraded its forecast for 2019 to just 0.3% from 0.5%. GDP forecasts remain unchanged for 2018 and 2019, both at 1.3%.